The missile was sent from Orlando International Airport in early 2014 to be used in a North Atlantic Treaty Organization military exercise, said the people familiar with the case. As with other sensitive military gear, the shipping crate was clearly marked as containing material subject to rigorous export controls, and that shipping information would have made clear to anyone handling it that it wasn’t regular cargo, these people said. The missile was sent by its manufacturer, Lockheed Martin Corp., after the company got permission from the State Department, which oversees the sharing of sensitive military technology with allies. A Lockheed Martin spokeswoman declined to comment on the matter, referring queries to U.S. government officials. The people familiar with the case said the missile was sent to Spain and used in the military exercise. But for reasons that are still unclear, after it was packed up, it began a roundabout trip through Europe, was loaded onto a truck and eventually sent to Germany. The missile was packaged in Rota, Spain, a U.S. official said, where it was put into the truck belonging to another freight-shipping firm, known by officials who track such cargo as a “freight forwarder.” That trucking company released the missile to yet another shipping firm that was supposed to put the missile on a flight originating in Madrid. That flight was headed to Frankfurt, Germany, before it was to be placed on another flight bound for Florida. At some point, officials loading the first flight realized the missile it expected to be loading onto the aircraft wasn’t among the cargo, the government official said. After tracing the cargo, officials realized that the missile had been loaded onto a truck operated by Air France, which took the missile to Charles de Gaulle Airport in Paris. There, it was loaded onto a “mixed pallet” of cargo and placed on an Air France flight. 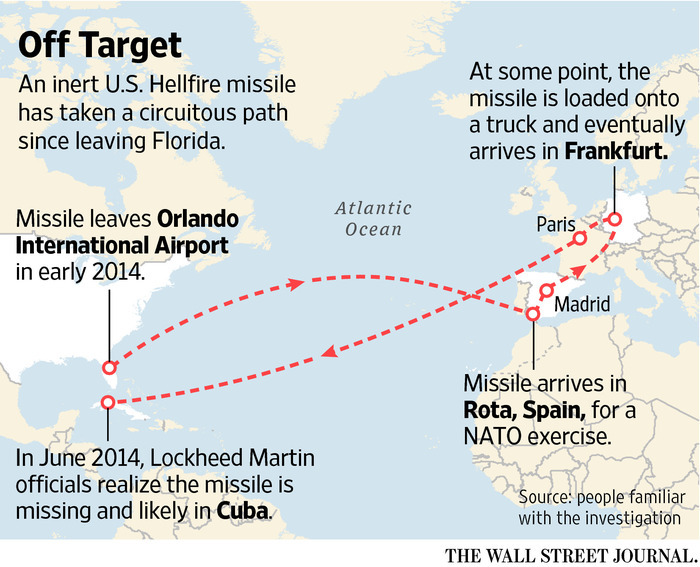 By the time the freight-forwarding firm in Madrid tracked down the missile, it was on the Air France flight, headed to Havana.Attempts to reach Air France were unsuccessful. When the plane landed in Havana, a local official spotted the labeling on the shipping crate and seized it, people familiar with the case said. Around June 2014, Lockheed Martin officials realized the missile was missing, was likely in Cuba, and notified the State Department, said those familiar with the matter. “Was likely in Cuba.” Think about that for a moment. Send them a Tile! and the White House carried on with the negotiations. Parting question: Just how many Hellfires are there, and where are they? Raul to Obama: “El perro se comio el cohete”! If the U.S. knew about Castro having the missing Hellfire missile since June 2014 — why didn’t it make its return a condition for the normalization of relations, which it announced in December 2014? Moreover, if Castro won’t return this missile, the Obama Administration didn’t know how it got to Cuba and U.S. intelligence agencies are concerned that the technology being shared with other rogue actors — why did it proceed to remove Cuba from state-sponsors of terrorism list in May 2015? From a legal perspective, and I’d need a lot more facts to confirm, there appear to be multiple violations of the Arms Export Control Act, as well as other laws. And since the Obama Administration has been reforming the export control regulatory system, Congress may want to probe whether recent changes to the licensing system created the conditions, or a lax enforcement environment, that resulted in one of the most advance U.S. missile system ending up in the hands of a rogue regime. How Did an American Hellfire Missile End Up in Cuba? Linked to by Instapundit‘s Ed Driscoll. Thank you! Linked to by Granite Grok. Thank you! Linked to by Proof Positive. Thank you! President Nicólas Maduro sends a message of his loyalty to Iran. Venezuela has reason to fear increasing irrelevance as North America becomes more energy independent. This makes Iran crucial. Mr. Maduro may be trying to establish himself as a leader as committed to the anti-American cause as was his predecessor, Hugo Chávez, who had a strong personal bond with former Iranian President Mahmoud Ahmadinejad. He also needs to establish his own place in South American politics. Reaching out to Mr. Snowden is a way to send a message to the world that notwithstanding Secretary of State John Kerry’s feeble attempt at rapprochement with Caracas last month, post-Chávez Venezuela has no intention of changing the course of the Bolivarian revolution. Rather, as the economy of the once-wealthy oil nation deteriorates, Mr. Maduro is signaling that Venezuela wants to become an even more loyal geopolitical ally and strategic partner of Russia and Iran. While the U. S. State Department ignores Iran’s allies in our hemisphere, Iran has, for nearly two decades, assiduously cultivated terror and crime networks in LAtin America. Read this report, AMIA CASE: ARGENTINIAN PROSECUTOR ALBERTO NISMAN ACCUSED THE IRANIAN REGIME, AND MOHSEN RABBANI IN PARTICULAR, OF INFILTRATING LATIN-AMERICAN COUNTRIES, BUILDING LOCAL CLANDESTINE INTELLIGENCE STATIONS DESIGNED TO SPONSOR, FOSTER AND EXECUTE TERRORIST ATTACKS, WITHIN THE PRINCIPLES TO EXPORT THE ISLAMIC REVOLUTION; it’s worth your time. Secretary of State Hillary Clinton was hospitalized Sunday after doctors discovered a blood clot during a follow-up exam related to a concussion she suffered this month, her spokesman said. She is expected to remain at New York Presbyterian Hospital for the next 48 hours so doctors can monitor her condition and treat her with anti-coagulants, said Philippe Reines, deputy assistant secretary of state. I wish her a prompt and full recovery. This can be a most serious condition. “Her doctors will continue to assess her condition, including other issues associated with her concussion,” Reines said. Head concussions do not cause leg or lung clots. Was she ever evaluated in an Emergency Department? Did she even go to the hospital? Did she undergo head CT scanning? This is standard of care for head trauma patients. As I understand it, a complication such as a blood clot is only found in polytrauma patients, in which case the question of did she ever go to a hospital for the concussion is more important. Particularly since it prevented her from testifying on Benghazi. What’s Happening to Hillary? Only a clod would say the clot is a plot! We weren’t told the site of said blood clot. Was it her brain (recently concussed)? Was it her leg (where she had a blood clot back in 1998)? The former is a big deal, the latter, not so much. Why not specify the site, since it make such a big difference, medically? Oh, but we’re told we must not display any skepticism, any hint of suspicion that the SOS is trying to avoid having to testify about Benghazi. The woman is ill. Only a clod would say a clot was a plot. How serious is Hillary’s condition? We are left with a story that is not easy to connect up with sparse information from the inside crowd, who could easily deflate speculation with two or three more measly facts. The suppression of information — the site of the clot — suggests 2 radically different theories: 1. fakery/exaggeration to evade testimony, or 2. something horribly serious. Let’s pray that she will soon recover in full; after which, she should testify on Benghazi. are you saying that Hillary (who has a history of DVT’s) suffered an intracranial hemorrhage 3 weeks ago that went unnoticed by herself and her crackerjack team and did not so much as require a visit to the ER or a simple CT head scan? The four officials supposedly out of jobs because of their blunders in the run-up to the deadly Benghazi terror attack remain on the State Department payroll — and will all be back to work soon, The Post has learned. The highest-ranking official caught up in the scandal, Assistant Secretary of State Eric Boswell, has not “resigned” from government service, as officials said last week. He is just switching desks. And the other three are simply on administrative leave and are expected back. The four were made out to be sacrificial lambs in the wake of a scathing report issued last week that found that the US compound in Benghazi, Libya, was left vulnerable to attack because of “grossly inadequate” security. They ought to be, but the media’s been assiduously ignoring this story. This looks as though the Benghazi coverup is continuing at the State Department. Remember we still haven’t heard from Obama, or Clinton (Who were not questioned as part of the Accountability Review Board report) in fact Mrs. Clinton has not been seen in public for almost two weeks–she must have had one heck of a concussion. “If public reports are true, it is disgraceful and deceitful that senior officials at State who ignored multiple pleas of help from our consulate in Benghazi continue to have any influence over our foreign policy abroad. While I have asked State Department officials several times for clarification on this administrative matter, they remain silent. Paul Mirengoff calls it “misdirection on top of misdirection“; I call it lies. 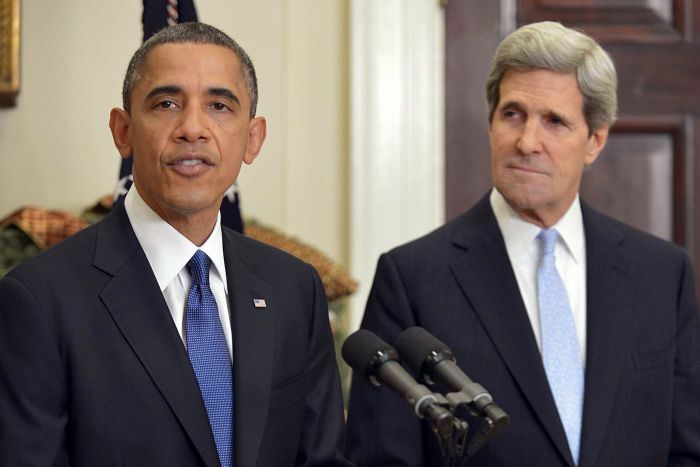 US president Barack Obama on Friday has announced the nomination of US Senator John Kerry to replace Hillary Clinton as secretary of state, calling him the “perfect choice” to guide American diplomacy in the years ahead. “In a sense, John’s entire life has prepared him for this role. Having served with valour in Vietnam, he understands that we have a responsibility to use American power wisely,” he said. Back in Sandinista Days . . .
Kerry has a record on Latin America — a substantial one. You will recall the 1980s, and that decade’s fierce debates over Central America policy. At the heart of these debates was Nicaragua: the Sandinistas, Castro, and the Soviet Union versus the Contras and the United States (or rather, not all of the United States: the Reagan administration, in particular). Kerry was an important player in all this. He was part of a group derided by Republicans as “‘Dear Comandante’ Democrats,” for they would address letters to Daniel Ortega, the Sandinista No. 1, “Dear Comandante.” (“But that’s his title,” they would plead, not unreasonably.) This group included such House members as Mike Barnes and Pete Kostmayer, and such senators as Chris Dodd and Tom Harkin — and John Kerry. An independent inquiry into the attack on the United States diplomatic mission in Libya that killed four Americans on Sept. 11 sharply criticized the State Department for a lack of seasoned security personnel and for relying on untested local militias to safeguard the compound, according to a report by the panel made public on Tuesday night. The investigation into the attack on the diplomatic mission and the C.I.A. annex in Benghazi that resulted in the deaths of Ambassador J. Christopher Stevens and three other Americans also faulted State Department officials in Washington for ignoring requests from the American Embassy in Tripoli for more guards for the mission and for failing to make sufficient safety upgrades. The panel also said American intelligence officials had relied too much on specific warnings of imminent attacks, which they did not have in the case of Benghazi, rather than basing assessments more broadly on a deteriorating security environment. By this spring, Benghazi, a hotbed of militant activity in eastern Libya, had experienced a string of assassinations, an attack on a British envoy’s motorcade and the explosion of a bomb outside the American Mission. Finally, the report blamed two major State Department bureaus — Diplomatic Security and Near Eastern Affairs — for failing to coordinate and plan adequate security. The panel also determined that a number of officials had shown poor leadership, but they were not identified in the unclassified version of the report that was released. The full report is here (h/t PowerLine). Clinton’s story beggars belief: While traveling in Europe, she contracted a stomach virus . . . which made her dehydrated . . . which made her faint at home . . . which caused her to fall and hit her head . . . which gave her a nasty concussion. She didn’t even go to the hospital for the “nasty concussion”, and didn’t get a note from her doctor. then she “took responsibility“, headed out of town, and now is concussed. She may be expecting a gallbladder attack any day now. Susan Rice Withdraws Name From Secretary Of State Consideration because she’s saddened by partisan politics. . . so she went to NBC to talk about it. In the name of reconciliation, RUF fighters were given amnesty. Sankoh was made Sierra Leone’s vice president. To sweeten the deal, he was also put in charge of the commission overseeing the country’s diamond trade. All this was foisted on President Kabbah. Brett Stephens has much more on Rice’s failures in Africa; specifically concerning Rwanda, Ethiopia, and the Democratic Republic of Congo. Somewhere Teresa Kerry’s toasting John’s new job. If Obama chooses Rice as his National Security Adviser in his second term, that post would not require Senate confirmation.